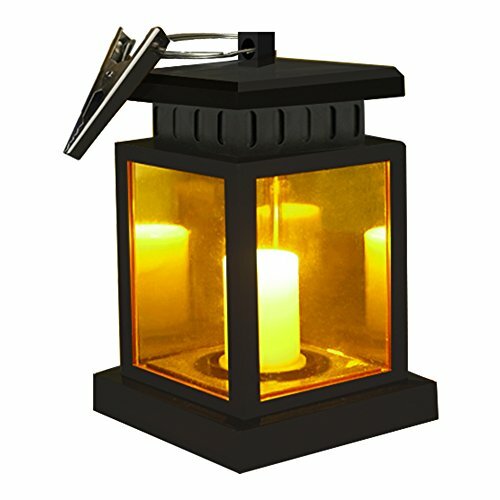 3.Turn the buttom switch to "AUTO"
1.The solar lantern will be charged only when the switch it turned to "AUTO"
Size: 3.46" x 3.46" x 5.5"
SMALL & PORTABLE: Solar candle lights size: 3.46" x 3.46" x 5.5", equipped with a durable hanging solar lamp and a circular ring, easy to hang solar candle lantern to anywhere you want. AUTO ON/OFF: Turn the bottom switch to "AUTO", solar lantern light will automatically charge itself during the day and light up at night. And lantern candle light is solar powered, put hanging solar lanterns under the sunshine to absorb the solar energy, then the solar panel will transfer the solar energy into electricity. Really energy-saving and help you save money. ROMANTIC ENVIRONMENT: Solar umbrella lights emit a faint yellow light and keep flashing like the wind blows over candles, create a romantic and comfortable space to you and your family. MULTI-SCENARIO USE: Patio umbrella light with a cute clamp, very durable and powerful, can be hung on umbrella, tent, tree, garden, patio, walkway, fence, backyard and elsewhere. Solar powered path light decorate your environment when you are camping, partying, fishing and so on. WATERPROOF & GUARANTEED: Solar lantern outdoor lights made of durable and waterproof IP44 ABS plastic, no more worries about raining, snowing and frosting, perfect for outdoor use. Provide 365 days warranty, just message us, we would send new solar lights or refund you to make you 100% satisfied. If you have any questions about this product by Honor-Y, contact us by completing and submitting the form below. If you are looking for a specif part number, please include it with your message.